Delivers 38 Highway MPG and 30 City MPG! This Honda Accord delivers a Intercooled Turbo Regular Unleaded I-4 1.5 L/91 engine powering this Variable transmission. Wheels: 17 Machine-Finished Alloy, VSA Electronic Stability Control (ESC), Valet Function. *This Honda Accord Comes Equipped with These Options *Trunk Rear Cargo Access, Trip Computer, Transmission: Continuously Variable -inc: sport mode, Tires: 225/50R17 AS, Systems Monitor, Strut Front Suspension w/Coil Springs, Steel Spare Wheel, Speed Sensitive Variable Intermittent Wipers, Single Stainless Steel Exhaust, Side Impact Beams. A new Honda Accord could be a great choice if you’re searching for a vehicle with these features and more: A high-powered 4-cylinder engine with up to 252 hp, Honda Sensing advanced safety features, a High tech interior with an 8” Display Audio Touchscreen, and the superior visibility of LED headlights. Still not convinced? Find out why the experts at Motortrend think the new Accord is a better choice than the Camry, then explore Honda of Greeley’s selection of new Accord trims, configurations, and colors. 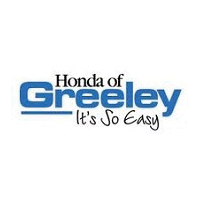 Why Choose the New Honda Accord at Honda of Greeley?